*Low Price Guarantee! We will beat any online advertised delivered price by $10. Save money on shipping when ordering more than 1 table. 50% off the flat rate shipping costs on each additional table ordered over 1. 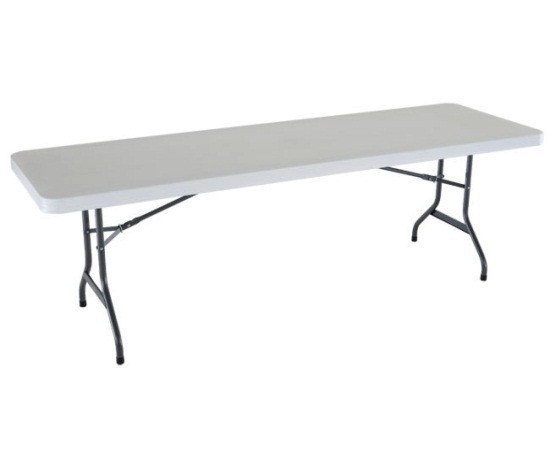 Get quick banquet table space for your upcoming event with this 8-foot Lifetime plastic folding table. 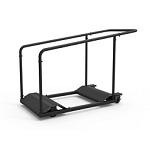 This table features a high-density polyethylene (HDPE) plastic table top and a powder-coated steel folding frame. The 8-foot table length, 30 inch width is typically enough space to seat 8 to 10 adults comfortably around the table. This folding table can be used both indoors and outdoors. Inside, the table feet have caps that help protect the floors. Outdoors, HDPE plastic does not fade, crack, or peel like traditional plastics, and the powder-coated steel frame resists rusting. 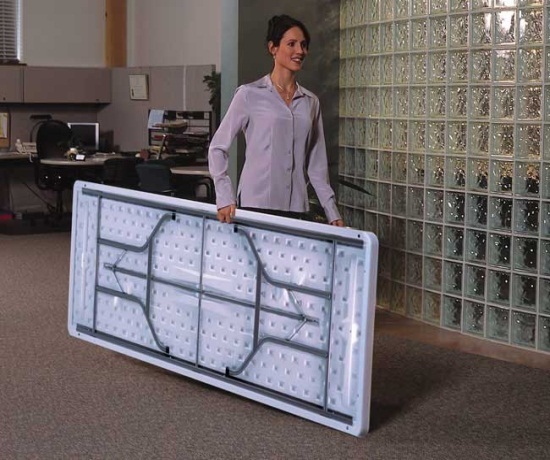 This commercial folding table features a 2,000-lb. 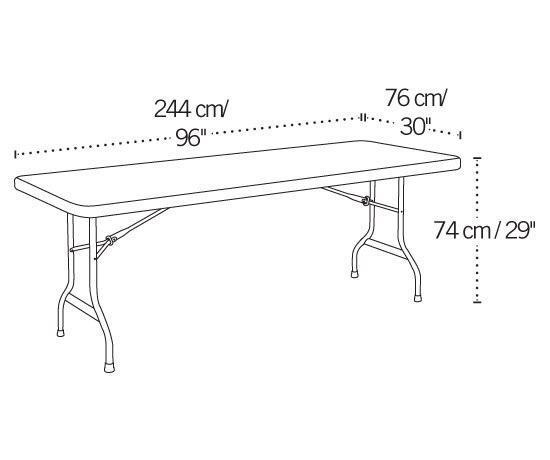 weight capacity, making the table sturdy enough for just about any banquet need. At a weight of 41-lbs., this table is easily transported. The folded width of the table is a mere 2 inches, making this table easily stored. Comes with a 10-year warranty from Lifetime Products. Molded Top, 1-1 8" Round Gray Hammer Tone Folding Frame, Indoor Outdoor Use (Replaced Lifetime Utility Table Almond 8 22989). This table is quick and easy to set up for large dinner banquet parties indoors or outdoors. Very weather resistant against sun, rain, wind, etc. The table top is very easy to clean. Why purchase a Lifetime Table? Lifetime tables are well-constructed products that can function as both banquet tables and utility tables for work spaces. 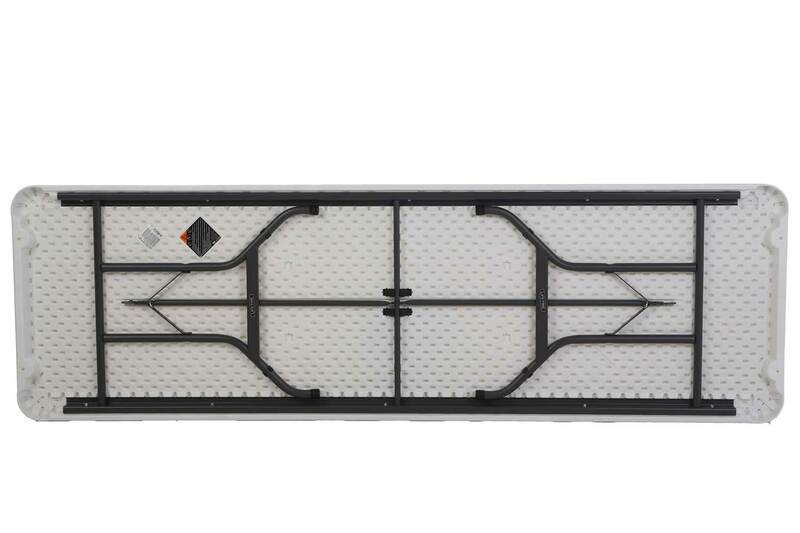 This table is easily cleaned, due to the polyethylene plastic table top The frame is made with steel and holds up well frequent use. 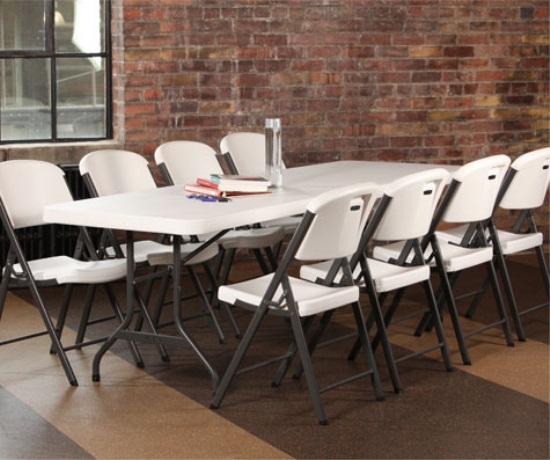 If this folding table is used as a banquet table, the table generally seats 8 adults comfortably; though, up to 10 could probably be seated if you place 1 adult on each of the ends of the table. 42980 Lifetime Plastic Tables. Save money per table by ordering this table in a 4-pack. 2980 Lifetime Plastic Tables. 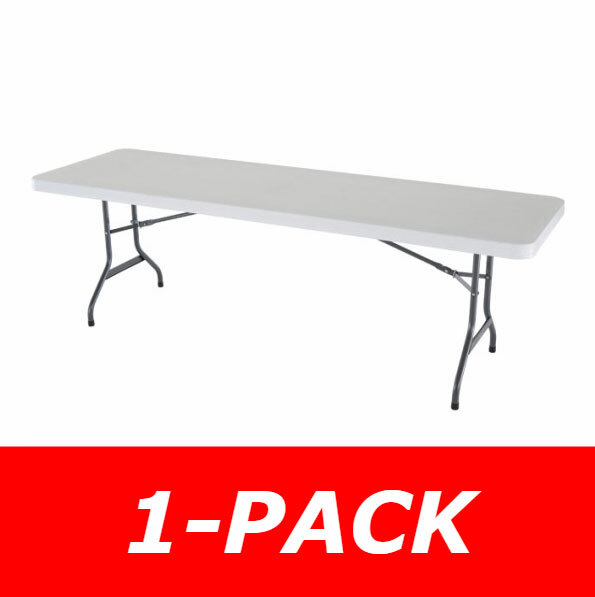 Save even more money per table by ordering this table as a 21-pack. 42804 Lifetime Folding Chairs. 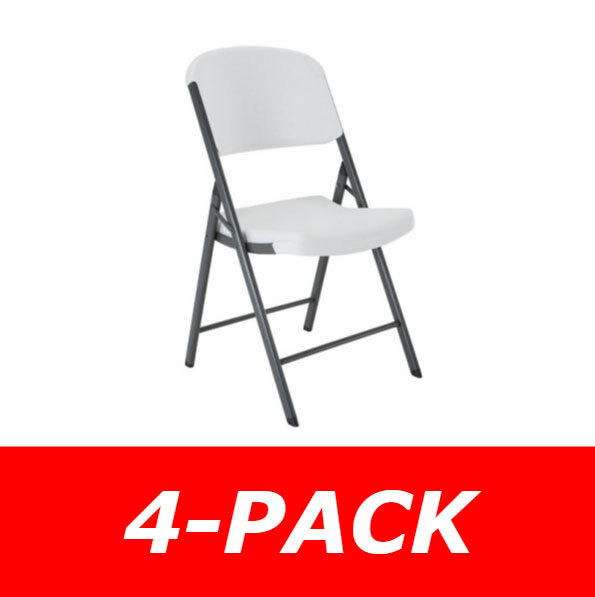 This is the matching chair for the 22901 sold as a 4 pack. View our other Lifetime Tables, Lifetime Chairs, and table cart. Dimensions: 96 inches L x 30 inches W.
Made with 18 gauge. steel. Shipping dimension: 100.88 inches L x 30.5 inches W x 2.63 inches H.
Shipping weight: about 50 lbs. Great ... thank you! Great customer service!!! Not only do I like the presentation of this table, but it is also very user friendly. I can fold it up and put it away by myself; it is light yet, very strong. I can tell this is a good quality product. I own one of these and so do my parents. They are surprisingly lightweight compared to the old wooden ones we have had in the past. They also clean very easily. We use ours mainly for family gatherings in the backyard such as barbecues. My wife has used it as a scrap booking table when she gets together for girls night out. The driver of the ABF delivery truck was terrific. He brought the tables and chairs into the house without my asking. The customer support person from your company told me that they would be dropped at the curb. Q: How does it open? A: The table legs fold out from under the table, and are secured by sliding rings. Q: Do you guys warranty the product? Who handles the warranty? Shipping: Orders for the 22980 Lifetime 8 Foot Banquet Table in White Granite Color generally leave the warehouse the next business day. Dimensions: 101" x 31" x 3"